The BBA (British Board of Agrément) is committed to helping businesses and organisations supply the construction industry with products, systems and installers of the highest quality. Since 1966 the BAA has developed rigorous testing, inspection and certification services to support manufacturers and installers achieve e xcellence and provide reassurance throughout the industry. We have used the summer period to review the feedback from all our CASS stakeholders and have decided to make a number of changes to meet your needs. We have taken the decision to bring the Desktop Assessor team in-house at the BBA Head Office in Garston. The Team Leader position has been filled by Alice Buckeridge, who has worked in the Inspection Department at the BBA for two and a half years and will be reporting to Administration Manager Jorden Adams. Overseeing the training and competency of the Desktop Assessor Team on an ongoing basis will be Geoff Chambers, Head of Approval for Property Investigation. Mindful of your needs, we are keen to avoid duplication of processes and are pleased to announce that we have engaged eTech as our solution provider. Approximately 75% of you are already using the eTech platform and we are confident that this will significantly reduce the volume of data re-keying. 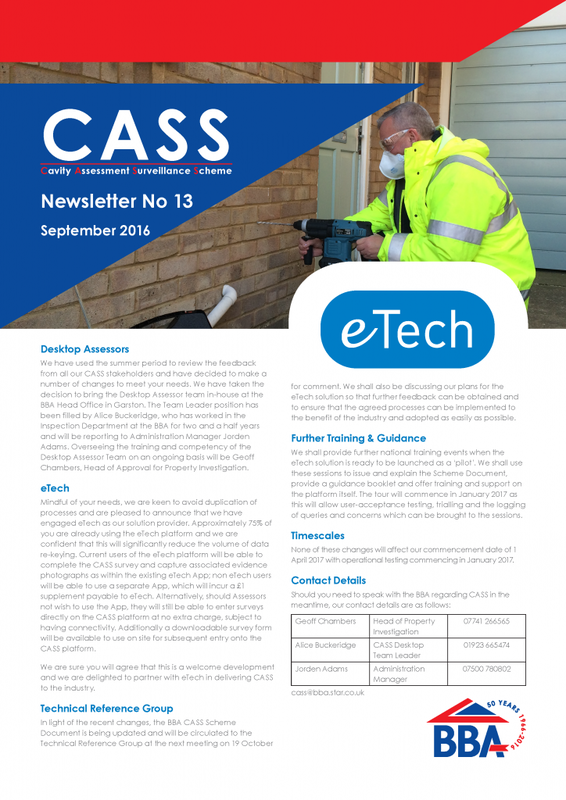 Current users of the eTech platform will be able to complete the CASS survey and capture associated evidence photographs as within the existing eTech App; non eTech users will be able to use a separate App, which will incur a £1 supplement payable to eTech. Alternatively, should Assessors not wish to use the App, they will still be able to enter surveys directly on the CASS platform at no extra charge, subject to having connectivity. Additionally a downloadable survey form will be available to use on site for subsequent entry onto the CASS platform. We are sure you will agree that this is a welcome development and we are delighted to partner with eTech in delivering CASS to the industry. In light of the recent changes, the BBA CASS Scheme Document is being updated and will be circulated to the Technical Reference Group at the next meeting on 19 October for comment. We shall also be discussing our plans for the eTech solution so that further feedback can be obtained and to ensure that the agreed processes can be implemented to the benefit of the industry and adopted as easily as possible. We shall provide further national training events when the eTech solution is ready to be launched as a ‘pilot’. We shall use these sessions to issue and explain the Scheme Document, provide a guidance booklet and offer training and support on the platform itself. The tour will commence in January 2017 as this will allow user-acceptance testing, trialling and the logging of queries and concerns which can be brought to the sessions. None of these changes will affect our commencement date of 1 April 2017 with operational testing commencing in January 2017.